Growth Habit: Teasel is commonly found in large clumps in damp areas, such as drains and creeks. It has stout flowering stems that can grow up to 2m in height. 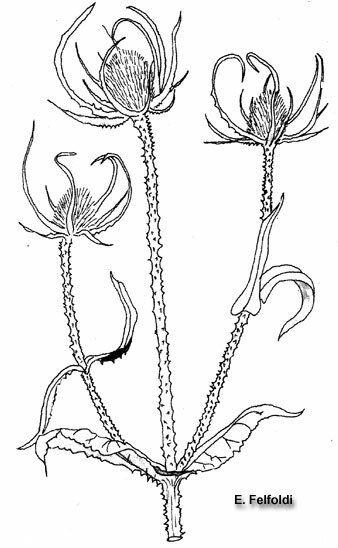 The stems are square in cross-section and are prickly. It has a deep fleshy, yellow taproot. The plant’s characteristic seed heads were formerly used to tease out impurities in wool, hence the common name teasel. Type of Plant: A stout biennial herb. Flowers: The conical flower heads are surrounded by spiny bracts. The heads are 5-10cm long and are located at the end of the stems. Numerous tubular florets are compacted in each head. Fruit/Seed: Greyish-brown seeds 3-4mm long and 1.2-2mm wide are produced in late summer. Dispersal: Seed is moved short distances by water and soil movement. Distribution: Teasel can be found in waste places, roadsides, creek banks and damp places. It is occasionally found in run down pastures. It can compete with pasture species, but pasture improvements can readily remove the plant. Often chokes small and slow moving waterways. Recorded as being used for medicinal purposes. Cultivation (autumn). Seedlings and rosettes can be killed through cultivation. Mowing/slashing (Early Summer- when flower have formed but seed has not developed). 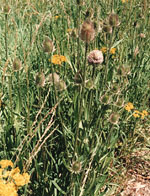 Flowering stalks should be mowed or slashed before they seed to help control the spread. Herbicide. Spot spray. Herbicides registered in Tasmania include dicamba, MCPA and glyphosate.